Campaign 241 (Oxford, Osprey, 2012). 96pp. $19.95/£14.95. ISBN 978-1-84908-616-5. 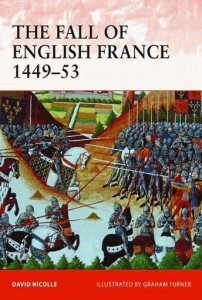 English historiography of the Hundred Years War, at least at the popular level, has tended to lose interest in the conflict after the death of Henry V. In this it mirrors the attitudes of contemporaries, reflected in a Parliament increasingly inclined to assume that the King’s French subjects should bear the costs of whatever ongoing military operations were required to finish off the war. Obviously there is an awareness of the actions of Joan of Arc, often credited in popular imagination with the ultimate French victory only achieved some twenty years after her death, but little else. It is revealing that Sellar and Yeatman, after acknowledging the role of Noah’s descendant “Joan of Ark” as the “only memorable French saint”, could find absolutely nothing memorable at all about the later years of the war to put in “1066 And All That”, their classic compendium of what bits of history teaching dispensed in elite private English schools during the early decades of the 20th century had stuck in the memories of those exposed to it. Given that curricula in state secondary schools tended to follow models articulated in elite establishments for many years after Sellar and Yeatman’s time one doubts whether a more socially inclusive follow up would find greater general awareness of the period now, particularly among a generation exposed to an English history curriculum often caricatured as focussed solely on the Tudors, Hitler and Stalin, and the American Civil Rights Movement. 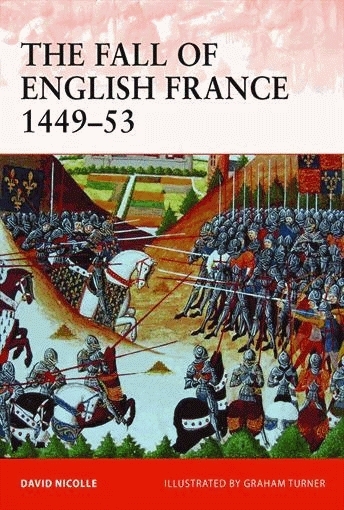 It may also be revealing that, while the Agincourt campaign was number nine in Osprey’s “Campaign” series, Crécy came in at 71 and Joan’s exploits at Orléans made 94, the final French victory has had to wait for number 241. This neglect cannot be for lack of colourful and potentially memorable events- Jean de Clermont and Arthur de Richemont meeting on the field at Formigny or the aged John Talbot riding towards the French guns at Castillon in a purple surcoat because he had sworn not to bear arms or wear armour against the King of France (even if he may possibly have been cheating by wearing padded clothing under the robes). Perhaps the publisher’s assumption was that a primarily Anglophone audience would have little relish for a tale of defeat against a French enemy who did not have the unfair advantage of a saint on their side. Nicolle’s text, in fairness, does not play to Anglo-Saxon prejudices (indeed he is quick to point up such prejudices in the works of those who have written on the subject) or imply that the French were somehow cheating by adopting firearms more thoroughly and effectively than their English opponents. This is a typical Osprey product, with the strengths and weaknesses of the genre. It provides a clear and focussed account of the campaigns in Normandy and Gascony, supported by detailed maps and battle plans and enlivened by lavish illustrations- not least Osprey’s trademark imaginative artistic reconstructions of high points in the campaigns (due in this case to Graham Turner). As a compendium of the basic chronology of the campaigns and the tactical and strategic environments that shaped the decisions taken by battlefield commanders it is excellent. Its assessments of the armies and their commanders are sound. On the other hand, the close attention to action in the field means that coverage of the wider political environment on both sides of the Channel is at times sketchy and a bit dated. The complex and duplicitous manoeuvres over the English surrender of Maine, which played a major role in setting the scene for the otherwise inexplicable and suicidal attack on Fougères, are given much less coverage than they merit. The analysis of the consequences of victory on the French side glosses over the fact that, while the French political system obviously did not implode in the way its English counterpart did in reaction to defeat, the later 1450’s were nevertheless a tense and edgy period with a rapidly aging Charles VII presiding over a faction-riddled court in which allegations of treasonable activity in the final campaigns of the war became common currency against those who fell from favour. The alleged attempt to bribe the Scots Guard at Cherbourg (39) is a product of this environment and may never have happened. Despite the attempts to create a national memory of victory in the 1450’s, it did not feel particularly like a triumphant decade in France-which may help to explain why French historiography is also surprisingly reticent about this period. Some purely military issues merit closer attention. The first French occupation of Gascony in 1451 is dispatched in a few lines. This hardly reflects the scale of effort deployed by Charles VII or the emphasis given in French royal ideology to the white cross supposedly seen in the skies over Bayonne which led to the surrender of the garrison. The English position in Normandy collapsed amazingly quickly, with garrison after garrison surrendering almost without firing a shot. Were they all intimidated into overnight capitulation by Bureau’s artillery train or were other factors at play? While it is difficult to imagine that sustained resistance would have altered the ultimate outcome of the war, one feels more sympathy for the Duke of Suffolk than he was given then or subsequently; he was surely entitled to expect the dense scattering of garrisons across Normandy to put up a better show and give him more time to organise a viable field army in England. Nicolle notes the amazing resilience of English military administration in Gascony even after Castillon (75-6) with musters being taken to the bitter end as all collapsed around the clerks writing them up. The same phenomenon is visible in Normandy for an earlier period. There is an intriguing disconnect here as equivalent French material from the same period rarely survives- an unusual example of a losing army being far better documented than its conquerors and a topic which merits further reflection. It is perhaps too much to expect a book written within the constraints of a very specific genre to deal with these wider issues and Nicolle has provided a very competent basic overview of an often-undervalued series of campaigns. The bibliography is thorough, though surprisingly it excludes Juliet Barker’s Conquest: the English kingdom of France, 1417-1450 (London, 2009; Cambridge, MA, 2012) and the chapter on Castillon in Hervé Drévillon’s Batailles: Scènes de guerre de la Table ronde aux tranchées (Paris, 2007). This entry was posted in BookReview and tagged 15C. Bookmark the permalink.